Girl Power! Thanks to @USGrail for posting this photo on their Twitter account. You can see many more Twitter highlights from attendees at the Commission on the Status of Women (#CSW57) on the UN Women Storify page. 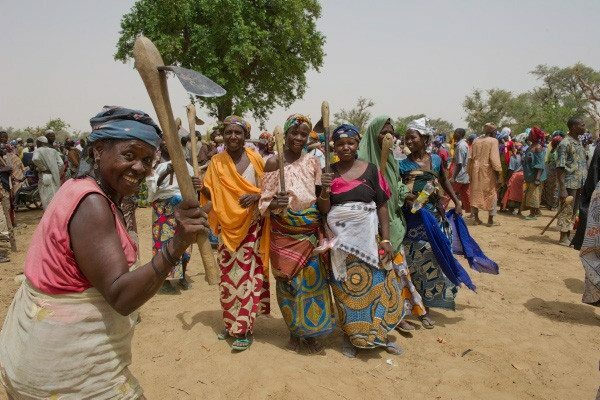 Check out this photo of women in the Sahel harvesting water to grow fruit trees. Thanks to the World Food Programme (@WFP) for posting this and more on their Twitter account. Spanish actor and Oscar winner Javier Bardem was at the UN Headquarters to discuss human rights in Western Sahara. Thanks to @MGM_RFKennedy for posting this and more on her Twitter account. Courtesy of the Israel Mission at the United Nations, Israeli superstar Rita gave an astounding performance at a “Tunes For Peace” concert held on 5 March in the General Assembly Hall. Thanks to @danarapo for posting this and more on her Twitter page. Watch Rita’s performance at the “Tunes for Peace” concert” above. Thanks to @IsraelinNewYork for posting this and more on their Twitter account. A female member of the Belgian demining team assigned to the United Nations Interim Force in Lebanon (UNIFIL) carries out the dangerous task of surveying the land for mines or cluster bombs in south Lebanon. Thanks to United Nations Mine Action Service (UNMAS) for posting this and more on their Facebook page. UN Disarmament supporter & Messenger of Peace Michael Douglas narrated this Global Zero video. Thanks to @UN_Disarmament for posting this and more on their Twitter account. Young runners sponsored by United Nations Population Fund (UNFPA) in Tanzania show off their medals at the Kilimanjaro Marathon. Thanks to @UNFPA for posting this and more on their Twitter account. Have a look at the extraordinary journeys children the world over undertake to reach to school each day. Journeys to School is part of an exhibit now on display at United Nations Headquarters in New York City. Thanks to @UNESCO for posting this and more on their Twitter account. Previous1st-ever “March on March 8” for International Women’s Day!